On Monday, Cherry and I continued our Haddam trails visits with a hike at what is called Route 81 loop. We found the trailhead on the north side of Beaver Brook Road, west of the junction with Route 9, and began our hike around 8:45AM. 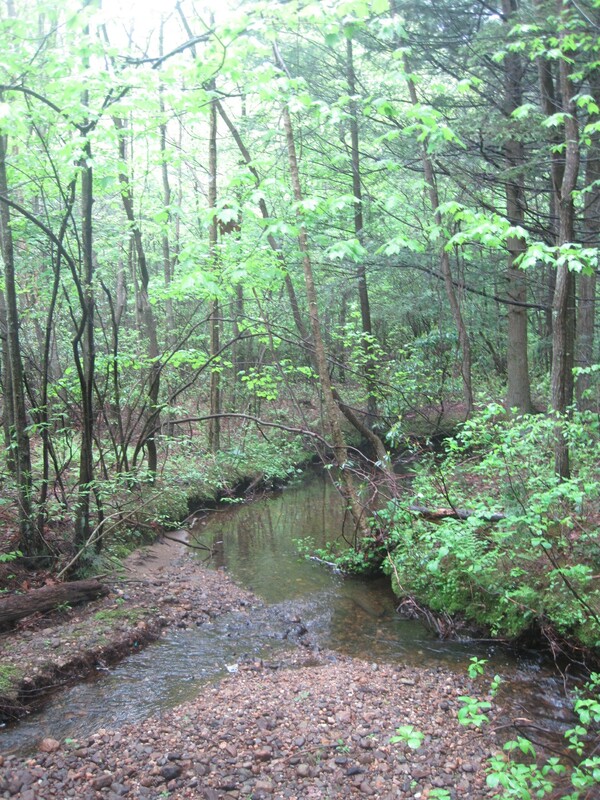 It was cool and gray as we crossed a gently flowing stream and wandered through dense vegetation. The trail was initially distinct and we had a map. Keep to the left, we decided, in order to avoid inadvertently leaving the main trail and ending up at one of the other parking areas. Cherry talked about nearing retirement and all the activities she’d been pursuing. Between church variety shows and a Master Gardener trip to the Cloisters, symphony performances and trying to clean out her files, she had been quite busy. She affirmed that this was the right decision for her and we laughed about how the timing evolved. 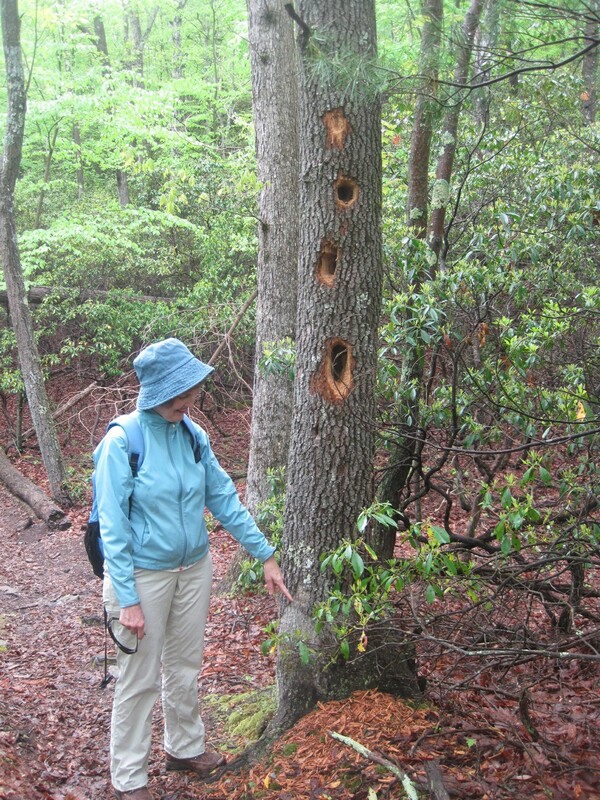 We found a live oak peppered with pileated woodpecker holes and trekked through large laurel thickets. We had surprise eye delights of swamp pink and lady’s slippers along the way. Cherry said she’d decided not to travel to Buenos Aires, but would be joining a church group to the Holy Land in February. She would have plenty of time to renew her passport and have something to look forward to all winter. 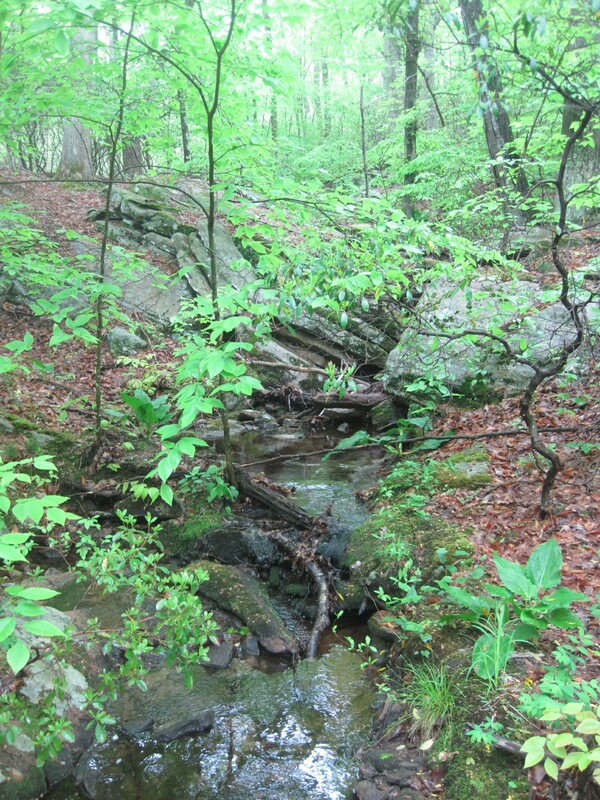 We crossed several small streams cascading over bedrock. With newly emerged leaves, the mixture of colors and patterns, combined with bird calls, the trail was enticing. I managed to discover yet another tick imbedded in me (that made three over the past 24 hours) and another crawling on me. I talked about progress with my city project to convert an old school to a senior center and the improved health of the 90 year old woman I assist (after a fall and stint at the hospital, she was now at the rehab center). The area was delightful, showing little sign of overuse. However, in a few sections, more bright green trail markings would have been useful, and perhaps a sign indicating the direction of the side trail to parking. After about two hours, we’d returned to the car parked on Beaver Meadow Road, completing a 2.7 mile loop. True confessions? We stopped by a local shop in Higganum to grab a snack, sit at an outside table, relax together, and schedule our next trip.